Over lunch two weeks ago a peer shared an anecdote about a mid-air collision that occurred a decade earlier. The reason for the collision: an air traffic controller (a human) told an airplane to descend, while a traffic collision avoidance system (a machine) told another to climb. Both the human and the machine arrived at the same conclusion as to where ‘their’ plane should be resulting in a collision. Rather than working in tandem, they worked independently and disaster ensued. 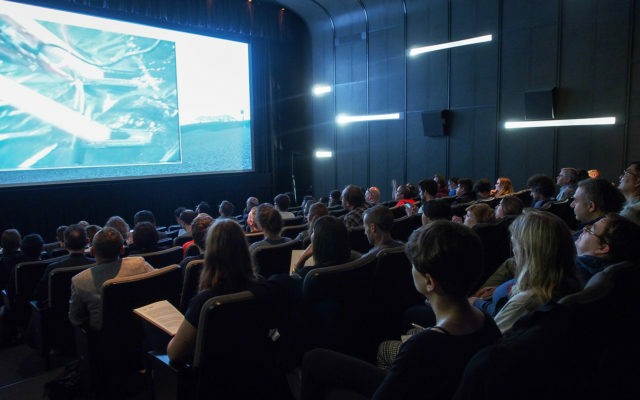 The third edition of International Digital Arts Biennial (BIAN) recently launched in conjunction with Montreal’s ELEKTRA festival, currently in its seventeenth year. This year’s theme is AUTOMATA, “art made by machines for machines”. It questions what aesthetics could potentially appeal to a machine that would take over for humans in the next step of the evolutionary process. 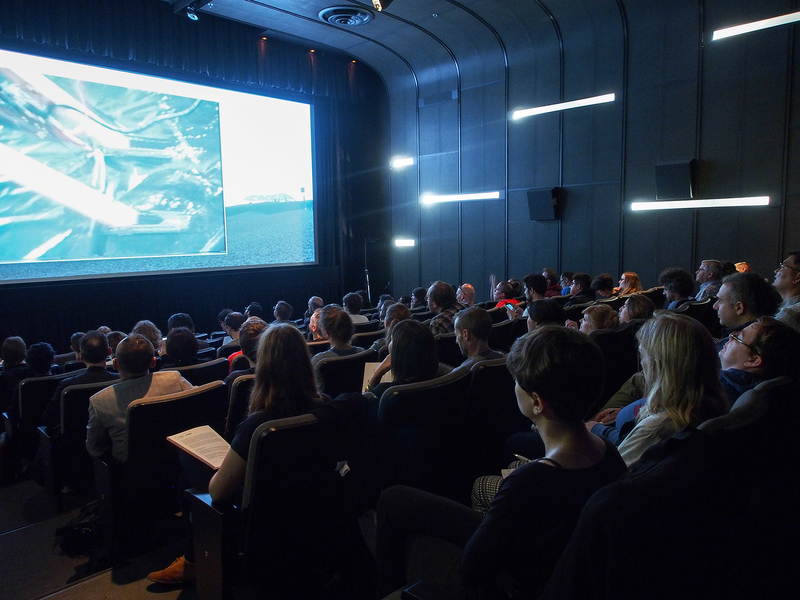 In the introduction to the show’s program, Alain Thibault, the artistic director of ELEKTRA and a co-curator of BIAN questions whether machines will have the “artistic sensitivity necessary for shared aesthetics.” AUTOMATA highlights this tension – how machines see in contrast to humans, how they live in harmony, or disharmony, with humans, and the kind of skill or expertise that robots can acquire to perform certain rote or expressive tasks. 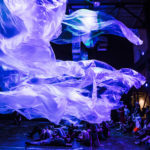 ↑ Fuse human and machine requires patience: ‘suiting up’ to participate in Bill Vorn’s exoskelton dance party Inferno takes almost a half hour. 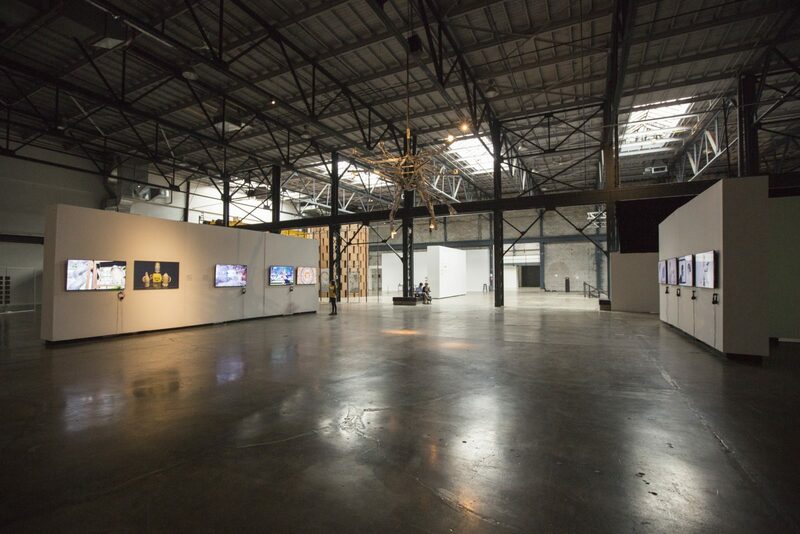 Both the BIAN and ELEKTRA were situated in the massive warehouse sized contemporary art foundation space, Arsenal. 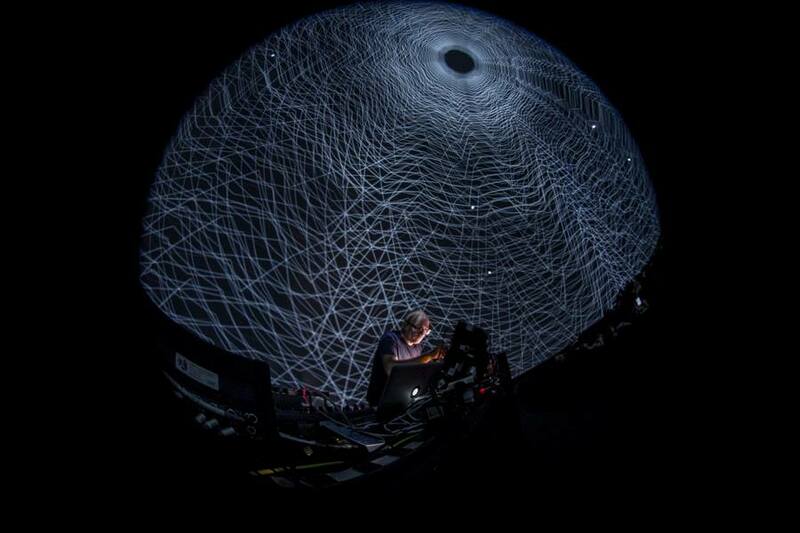 Across two nights, performances took place adjacent to the packed digital art exhibition. 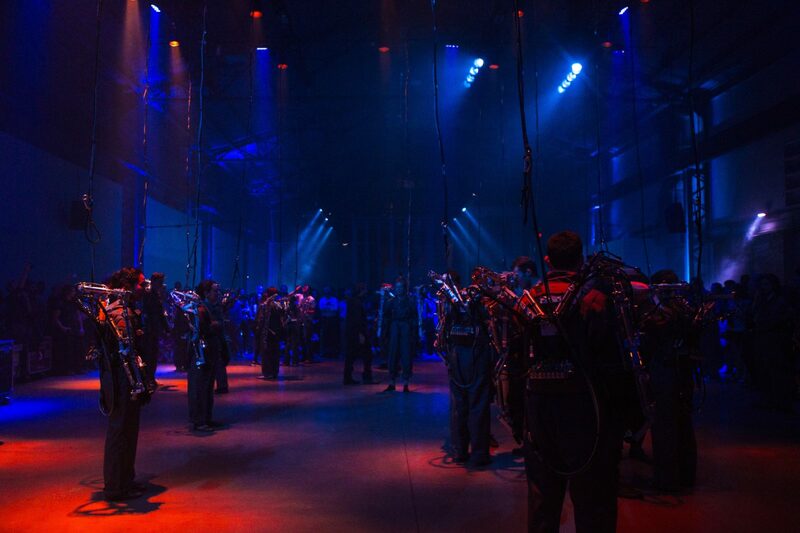 Louis-Philippe Demers and Bill Vorn’s cyborg ballet Inferno made the strongest impression with its machine-on-human cyberpunk rave. 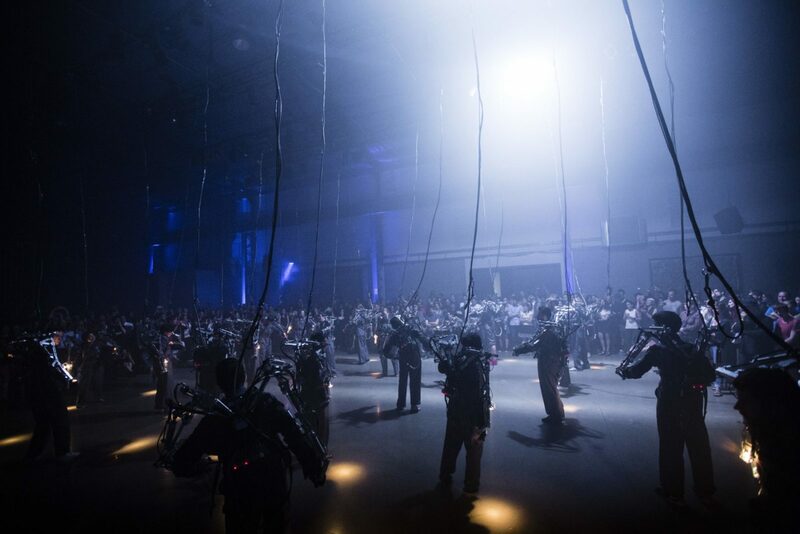 Volunteers signed up to strap into one of twenty-five exoskeletons that hung precariously from the ceiling in the middle of the space. Wearing gray jumpsuits, each participant looked like a ghostbuster equipped with a proton pack designed by David Cronenberg. Controlled by the artist during the performance, each suit forcibly moves the waist and arms of each volunteer. Strobing lights fitted at the end of the arms of each suit periodically ripped through the darkness over a thumping beat. Although the suits controlled the upper torso of each individual they were free to do what they like with their legs and feet. For the most part the reaction was to dance along with the choreographic coercion. Named after the famous depiction of hell by Dante, Inferno represents the physical punishment meted out on humans in the underworld. They experience various levels of submission and freedom where they are either encouraged to move or forced into different positions. While there is a perverse schadenfreude that accompanies watching a crowd forced to gesticulate against their will, it’s those moments of freedom that elevate the work and make it a joy to watch. A relationship is cultivated between each person and the suits they are wearing; they adapt to their limited freedom and learn to dance along with the choreography. To be sure, all choreography is a strict set of rules that demand a person or persons move in a very specific way without deviation. In that sense, movement as a rules-based act whether it be through dance or performance becomes machinic and algorithmic in its habituation. At least here, there is the tenuous ability to dance against the performance’s design. It underscores the larger theme of the BIAN in that while a machine might be in control it butts up against human will resulting in a complex interaction between the two. 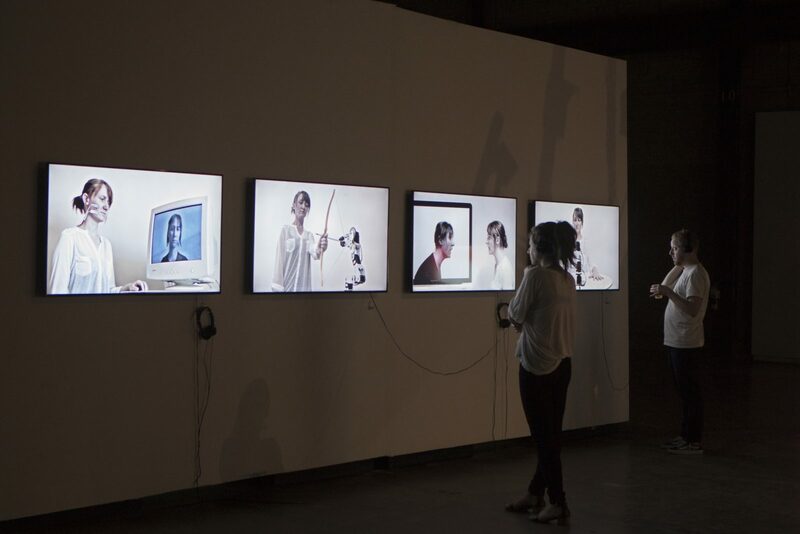 ↑ Nelmarie Du Preez’s Loops of Relation provides a suite of video vignettes exploring the artist’s uneasy relationship with technology. ↑ Ada Lovelace, Charles Babbage, Grace Hopper, John von Neumann, and others are constantly (dis)assembled in Paolo Almario’s Dyforme. 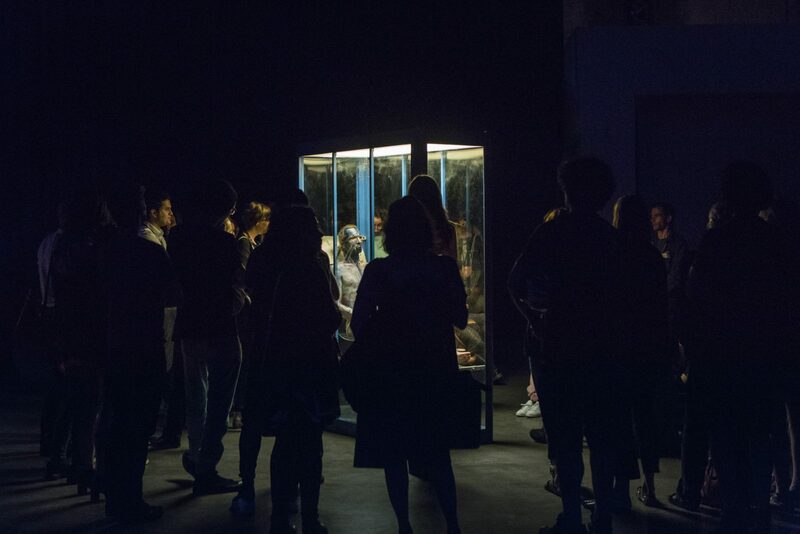 Nelmarie Du Preez’s Loops of Relation similarly addresses the machine versus human tension apparent in Vorn’s exoskeleton dance-off. Her videos are each punctuated with a sense of anxiety brought about by a piece of technology. Stab, with its knife-wielding single armed robot, recalls the famous scene in Aliens when the character Bishop (whom, it should be noted, is an android), rapidly stabs between the marine’s fingers. 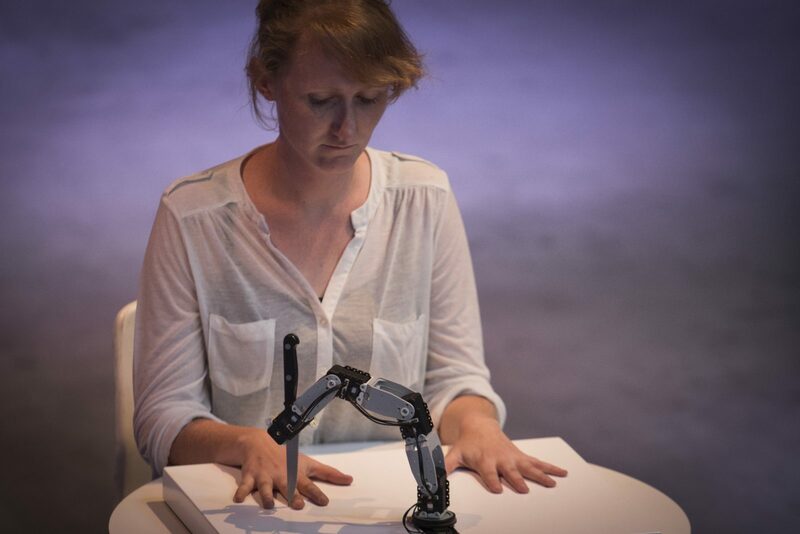 In another, she holds a bow while a robot hand pulls back an arrow that shudders with tension that is pointed squarely at the artist’s dour face. It feels like it could be released at any moment. 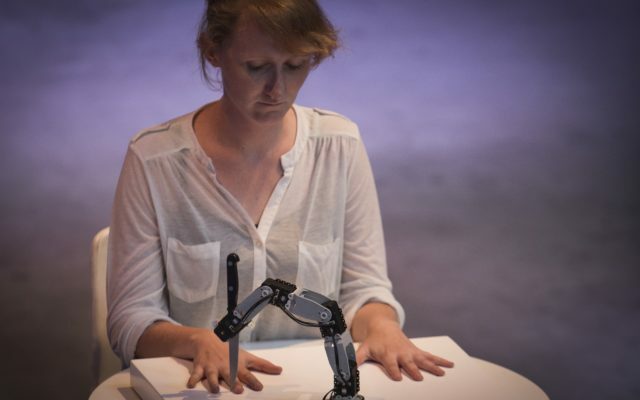 In each video Du Preez looks stressed, unhappy or expressionless as she interacts with her robot foe. 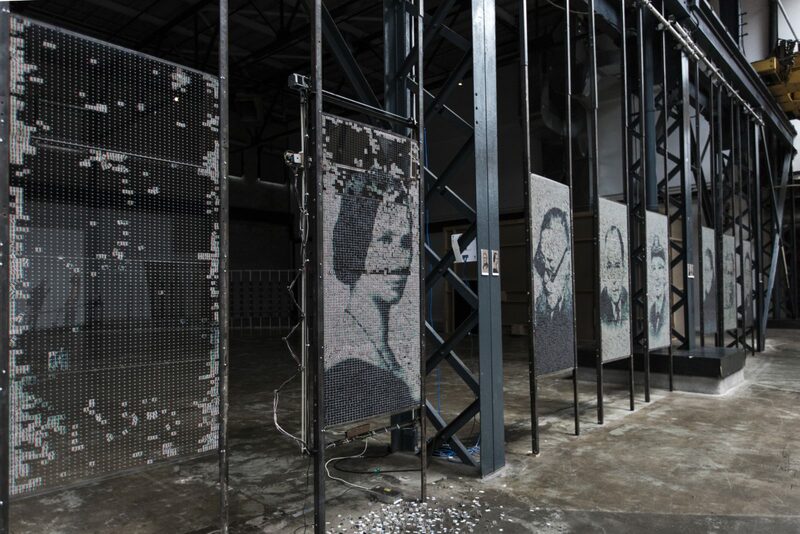 In Paolo Almario’s Dyforme, a motorized contraption very slowly punches out plastic elements that comprise portraits of foundational figures in the history of AI and computation. The humans who breathed life into them are annihilated as the machine transcends its source to become naturalized. Human pioneers, perhaps, are no longer needed when the machines can build and repair themselves. ↑ Robotlab’s Bios [Bible] (left) and Pe Lang’s positioning systems I – falling objects (right) explore the limits of precision and ‘the human touch’. A tension arises as well between what a human can do versus a machine’s capability. 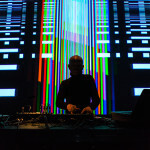 And between what it means to master something to the point of habit and that behaviour being algorithmic or mechanical. In Inferno, human movement is forced by a robotic suit. What then is the difference between a suit forcing that movement and a set of rules laid out by a choreographer? Technique can be the domain of both a machine or a human and the origin of an action means less than its result. 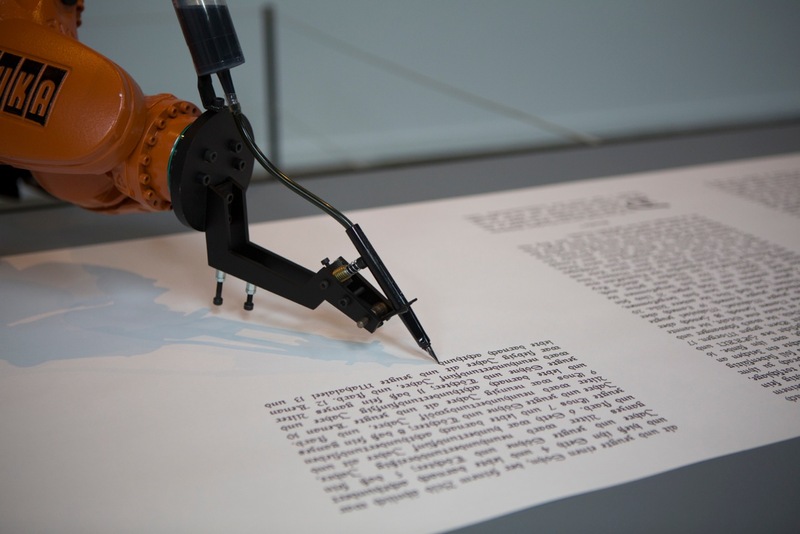 Robotlab’s Bios [Bible] meticulously transcribes the bible in perfect calligraphic style across a long scrawl of paper endlessly. In another time, such a style would be a mark of skill limited to only a few master scribes or clergymen capable of transcribing and reading books. Ironic, then, that in an era where the majority of human communication is now done through the formally inexpressive act of typing, that a robot can be designed to produce such a human-looking technique. The mastery or the internalization of a skill is tantamount to an algorithm that can be programmed into a machine much the same way that a human acquires it. 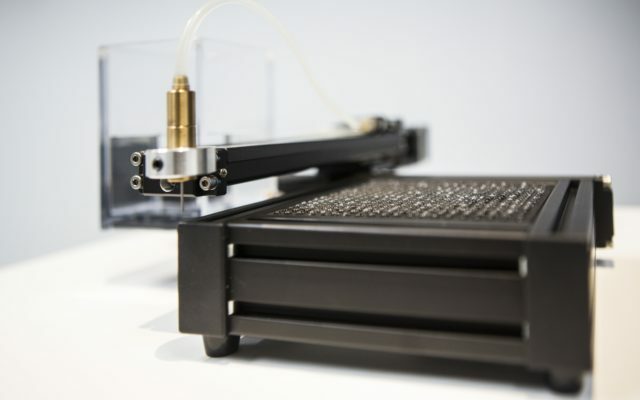 Alternatively, the precision of carefully placing perfectly round droplets of water onto a surface, portrayed in a work such as Pe Lang’s positioning systems I – falling objects is not a skill a human being could acquire through any level of practice. A machinic system can be programmed to adopt human-like skills but it doesn’t work the other way. 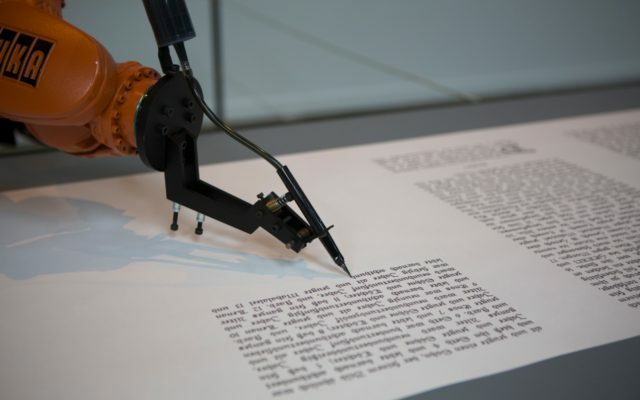 How a machine comprehends or what we might project onto a machine what we would call comprehension is altogether different from a rote, or algorithmic act, however. How a machine sees is much more distinct. In Patrick Tresset’s 5RNP Etude Humaine #1 a passive individual sits as if they were the subject of a live model drawing class. 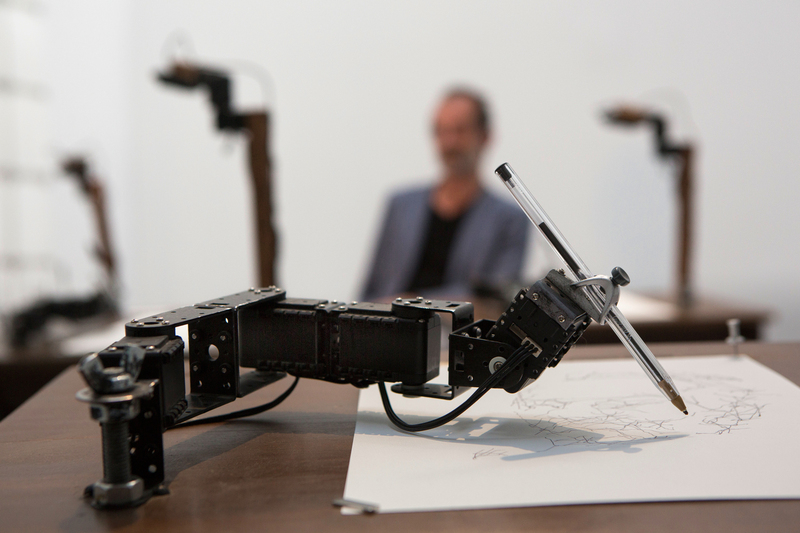 Five robots each then spuriously draw wiry portraits of the volunteer. We see multiple iterations of how a robot would perceive the sitting individual. 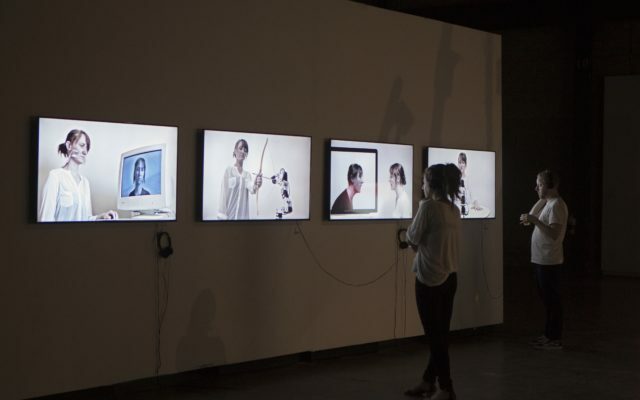 Minha Yang’s Portrait depicts an algorithmic approach to desire by substituting an instinct-based drawing with computation. The result is an expressive image of a pale white woman against a candy apple red background pulsating with emotion. 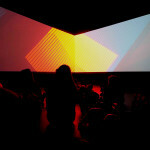 Abstraction becomes a way of representing how a machine sees. The same effect is achieved in Ben Bogart’s Watching & Dreaming a series of videos that imagines how an AI would see a film. In it, 2001: A Space Odyssey is reduced to a series of smeared abstractions where the original film gradually becomes indiscernible. What a human would consider abstract is presented as how a machine sees. 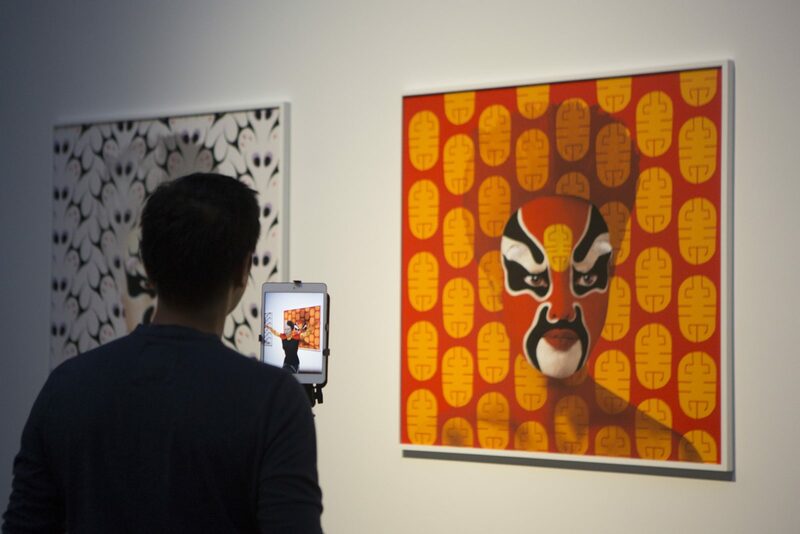 Expressiveness turned over into a kind of representation of vision through the eyes of an algorithm. Lukas Truniger’s Déjà Entendu | An Opera Automaton abstracts Faust in a similar way reducing it to its constituent elements in such a way that might be discernible to a machine but is rendered expressive to a human onlooker. Representation is subverted through the use of algorithms to become more machine readable. ↑ The IMDA (photo: Camille Montuelle), Julien Bayle at the Satosphere (photo: Sebastien Roy), and Yann Marussich’s Bleu Remix. This discussion doesn’t even mention strong works by Zimoun, UJOO+LIMHEEYOUNG, Benjamin Muzzin, Jean-Benoit Lallemant and Graham Caldwell, among others. 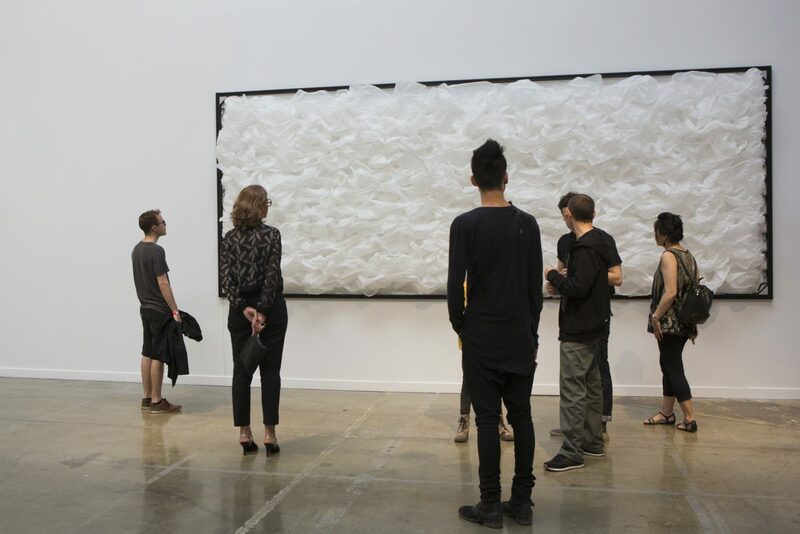 In addition to approximately 40 works by 37 artists featured in the Arsenal there were also several satellite exhibits spread throughout Montreal. 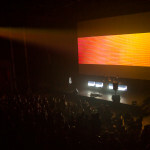 The ELEKTRA festival of which the BIAN is a part, hosted five other music and installation based performances besides Inferno over the course of two nights (the piece was performed three times). The BIAN continues to host artist events until it closes at the beginning of July. 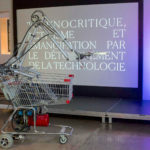 Several artists, institutions and gallerists, among them artist Sabrina Ratte, roboticist Norman T. White and representatives from Sedition and Arts@CERN gave presentations during the International Market for Digital Art (IMDA) at the Cinematheque Quebecois the first two days of the festivities. 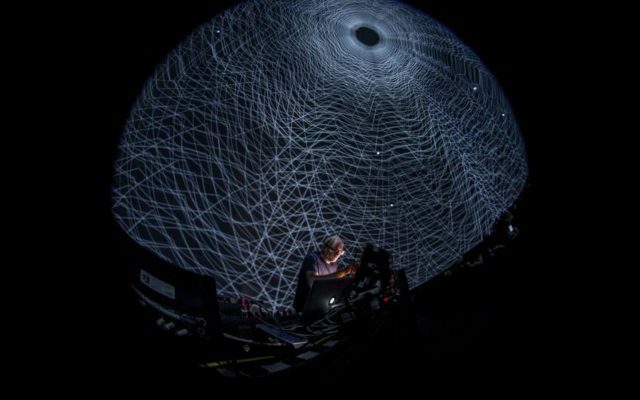 Cross-programming with IX Symposium and the Société des Arts Technologiques also included dome projection performances and a VR showcase. It is easy to be overwhelmed by just how much programming is involved with the event(s) but it is electrifying nonetheless. The unwieldy art and technology gestalt perfectly encapsulates the variety of work being done in the milieu. 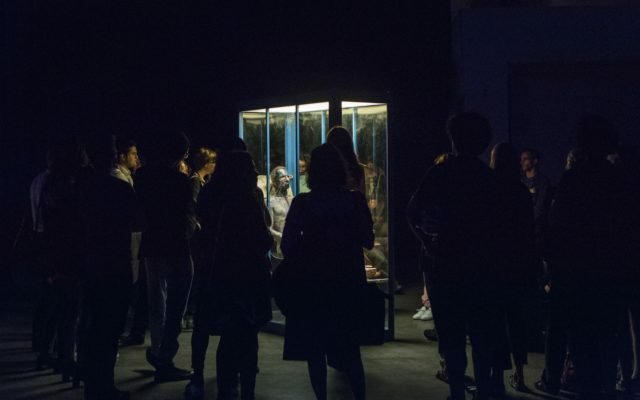 It would take days to adequately scrutinize all of the art present across the different venues and platforms participating in ELEKTRA, the BIAN and the IMDA. Yet anyone who did would probably be prepared to engage with their new machinic overlords in some less-than-preferable near future scenario. In a discussion about aesthetics, at least. In the opening anecdote about the two avoidance systems, one human, the other machine, the lack of coordination between the two lead to the destruction of two planes. The irony is that the arrival at the same solution is what lead to that result. The works in the BIAN show what happens when technology has more sway over our aesthetics without completely replacing them with something incomprehensible. It is likely that an aesthetic genuinely for machines would be too alien for humans to perceive it as such. Instead the art made by machines for machines sits comfortably adjacent to human comprehension in a state of constant tension. Human aesthetics are filtered or recreated algorithmically, computationally or robotically but they’re never totally occluded from view. Even at its most invasive, when technology locks horns with human will common aesthetic ground can be found.